This post is the fourth of five in a series. What happened at Villa Gardenia? This mess was just the main entrance, at the bottom of a hill, just off of Puncak Pass. A treeline blocked our line of sight up into the residential area (VKG’s so-called villas), which is why upon arrival we thought we had the wrong location because there was nothing to suggest that these damaged buildings were part of a functioning development. After confirming that we were at the right place, we cautiously pulled into the entrance and drove up the hill. Past the trees and around a bend we discovered that the main artery of the housing development had been almost completely washed out by landslides. Emergency embankments were temporarily preventing more of the road, and also the villas, from falling into a constricted river. I use the word “constricted” because it appears that the developers had originally built a deep but narrow channel to direct the flow of a mountain stream (a tributary of the Ciherang River, coming down the slopes of the volcano Gunung Gede) that passes through the VKG complex. 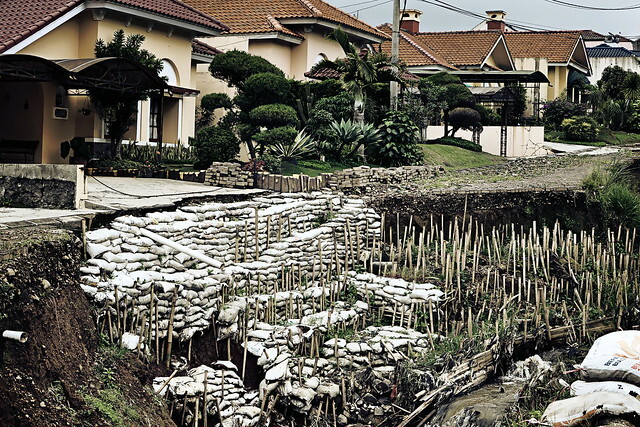 The cement conduit used to be a lane divider for VKG’s main residential boulevard, now a minor ravine after the landslide. We got lost on a lattice of emergency roads that were built around fallen sections of the road that cut off access to the houses further up the hill. We settled into the house where we would spend the weekend and I explored the neighborhood. Puncak is typically mobbed with visitors on weekends but VKG was nearly empty. Many of the houses had small “for sale” signs posted on their fences, and indeed I discovered later that if you browse for “Villa Kota Gardenia” on Google, the majority of listings are real estate sales (“dijual MURAH!!”). Toward the bottom of the hill, the dangling power lines were hanging dangerously low over the stream, while someone had resourcefully turned the banks of the landslide into a small terraced garden. According to local news sources archived online (links in the next paragraph), on at least two occasions in early 2010 (4 January & 10 March), the Ciherang River sent flash mudslides through the VKG complex. Boulders and other large debris from above clogged up the narrow drainage channel. The massive volume of mud spilled out of the drain and over the landscape, taking out the main road of the VKG complex and then completely covering the main entrance down below with so much mud and rocks that VKG residents were unable to reach the main road (Puncak Pass). The floods also damaged at least five houses beneath VKG across the road. The hills and valleys, the farm fields, have been transformed into steel-reinforced concrete gardens with glowing neon lights. To be fair, VKG did not strike me as a “luxury” development for the super-rich. The villas are densely packed, modestly sized, and few (if any) have remarkable views. Each house on the hillside struck me as an “I made it!” status symbol, a weekend getaway retreat for upwardly mobile Jakartans that are newly able to afford it. 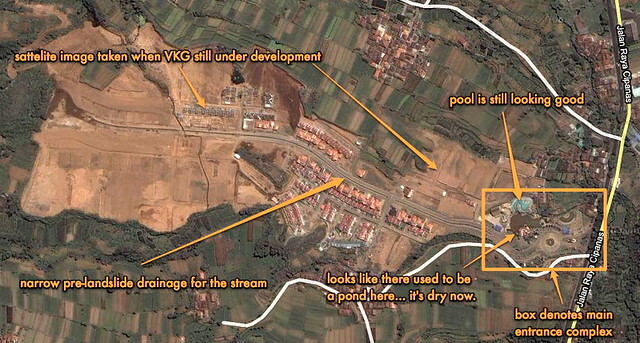 But collectively the VKG development is a recklessly engineered pox on the Puncak landscape. A critical development failure occurred here, and the wreckage all around VKG suggested to me that one year after the mudslides no one had been held accountable. In fact, a sign at the foot of the hill announced that road and drain repairs are paid for by VKG resident contributions. With so many “for sale” signs across the complex, and no doubt a collapse (along with the road) in the value of their VKG investments, it’s no wonder that the community hasn’t raised enough money to repair the damage. Where has the developer disappeared to? What do local officials who allowed VKG to be built on such shabby foundations think of this ruinous outcome? Are the VKG property owners really wholly accountable for cleaning up this mess? "perbaikan jalan & saluran dibiayi oleh sumbangan warga villa gardenia"
As I thought through these questions, that precious enchantment I first felt upon arrival at VKG’s desolate entrance increasingly gave way to a combined sense of disgust and outrage. 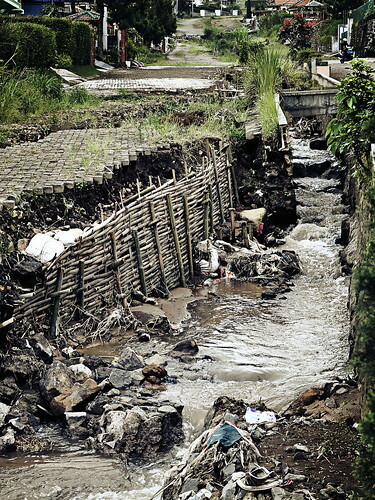 As a part-time resident of Jakarta for several years now, I have heard the abstract accusations lobbed up at overdeveloped Puncak for causing the floods that regularly plague us. But it doesn’t make all that much sense to frame the question in terms of antagonistic geographies when the rapacious appetites that have destroyed Puncak are indistinguishable from (if not have their origins in) business-as-usual in Jakarta. These are the corrosive forces that ruin, i.e. “inflict or bring great and irretrievable disaster upon; destroy agency; reduce to a state of poverty; demoralize completely” (Concise Oxford Dictionary). The ruins I described in the prior three posts are objects, trace metaphors of decay that inspire introspective contemplation, but I agree with the anthropologist and historian Ann Stoler who argues that an account of the ruin-as-object remains incomplete without a complementary account of the ruin-as-process. ** We must traverse and explore the inherent tensions between “two poles of decay,” both the evocative metaphors and violent degradations. 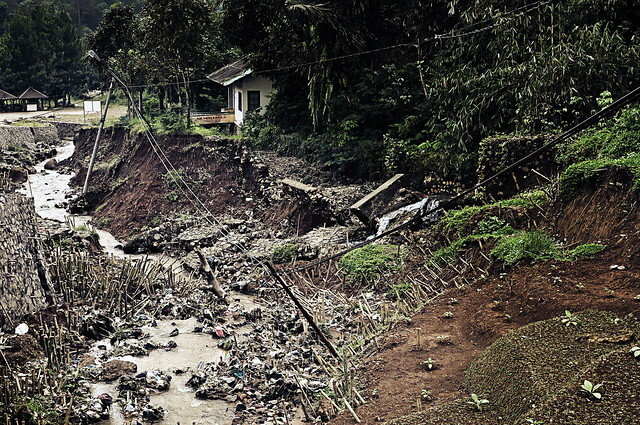 The catastrophic mudslides at VKG in early 2010 do not signal the beginning of ruination in Puncak. Pelita suggests 1984, and I might even go further and look at Puncak’s history as a hill station retreat for Dutch colonials in Batavia and Bandung. But the recent floods are a good place to start not just because the event is a relatively contained illustrative example of a larger problem, but also because the disaster and its immediate aftermath are a great point of entry. Disasters momentarily disturb everyday business-as-usual and in turn render ordinarily opaque (and unequal) social relations suddenly visible. Setting aside for now its journalistic merits, I enjoyed reading the Pelita article because it inadvertently reveals a lot about local dynamics in Puncak. Readers know why the security guard does not want his name given, just as we can probably guess why VKG management refused to comment on the allegations that rampant unlicensed development caused the disaster. The journalist ascribes more authority to local knowledge—the security guard who witnessed Ciherang River ash floods decades ago—than any developer that refuses to conduct an environmental impact assessment before building touristic agribusiness ventures and densely-packed villas. The total absence of any government officials from the account is as telling as it is troubling. Pelita’s accusations and sympathies are implicit and disorganized, but unambiguous. 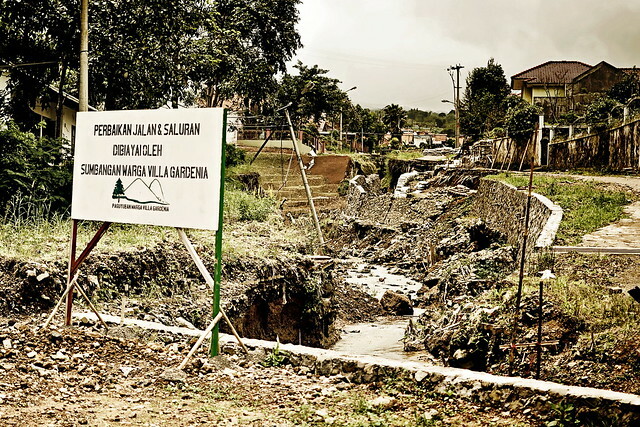 In the wake of the Sidoarjo mud lava catastrophe in East Java, we can well imagine that the destruction at VKG was simply written off as a “natural disaster,” allowing the conspicuously absent voices from Pelita’s account to continue their destructive business-as-usual without accountability. Meanwhile VKG lies in ruins and life goes on there, albeit more quietly and at a much lower net worth, despite so much damage and loss to VKG investors and the surrounding community. Stoler’s call to ask “how people live with and in ruins” snaps us out of the melancholic gaze upon the leftovers and redirects our engagement with ruins toward processes of ruination, and their attendant disavowals and disenfranchisements. ** Along the way we begin to understand not just the mechanisms by which ruination occurs with impunity, but also how resentment sediments almost imperceptibly into the lives of the ruined. The Pelita article only begins to hint at festering resentments in the community around VKG. * Note that the two newspaper articles use the names “Bukit Harmoni” and “Villa Kota Gardenia” interchangeably, or in some combination of the two. Perhaps VKG replaced the original BH name for the development at some point. ** Stoler, A.L., 2008, “Imperial Debris: Reflections on Ruins and Ruination” Cultural Anthropology, 23(2), pp. 191-219. 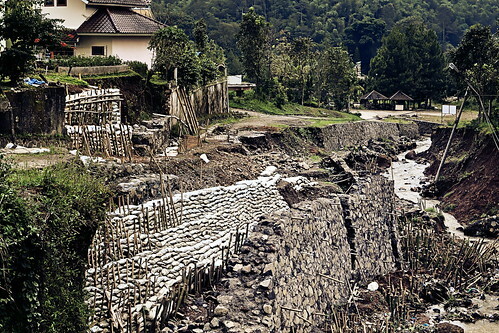 This entry was posted in Anthropology, Indonesia, Reflexive, Ruins and tagged Ann Stoler, catastrophe, Cianjur, Ciherang, Ciherang River, debris, decay, development, disaster, disavowal, disenchantment, disenfranchisement, floods, Gunung Gede, Indonesia, Jakarta, Jawa Barat, landslide, mudslide, nostalgia, Pelita, Pikiran Rakyat, postaweek2011, Puncak, Puncak Pass, ruination, ruins, structural violence, Sungai Ciherang, Villa Kota Gardenia, volcano, West Java. Bookmark the permalink. Many costumers of VKG had not yet have a certificate of the land although they already paid off the obligation. The VKG developer/management abandoned them…including me. We tried separately to take a law action but only meet a deadlocked.